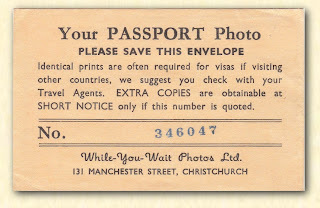 Early New Zealand Photographers: While-You-Wait Photos Ltd.
Now with an advanced background system and instant viewing and printing of images. Still a walk in studio in the mornings. "The biggest little studio in town"
Hello Phil, good to hear that your photographic business is still going strong today. Would you now be one of the longest established studios in Christchurch? I believe Standish and Preece remain, however there appears to be no connection between this studio and the one that was opened in 1885. Any further information about your studio or others in Christchurch would be welcome. 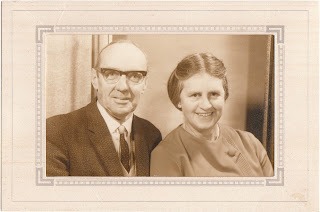 The photograph I use above is one of my mother's cousin and her husband, they both died about 10 years ago, so its nice to have this photograph of them. I would not rush to claim to be the oldest in town yet. Jon Hunter from Standish & Preece, now located in Linwood, and whom I drink a beer with often on Friday nights could argue the point. But you should come by for an update in the studio no charge to add am image of you to this amazing web site!